Amazingly, there have been 7 Sisense weddings in the past twelve months…which means we will soon be celebrating 7 (or more) births. So we were sitting around at the lunch table playing the ‘most unique’ baby name game and someone invariably brought up the name urban legends: the twins named Oranjello and Lemonjello or the baby girl called Female, pronounced fe-MAHL-ee. Are these urban legends real? Did someone really name their son Badass? We decided to find out. In walks Sisense…we quickly download the entire US Social Security Administration baby name database since 1910, freely available on their website. We loaded it up into an Elasticube…started pulling in some columns like baby names, states, year and gender. 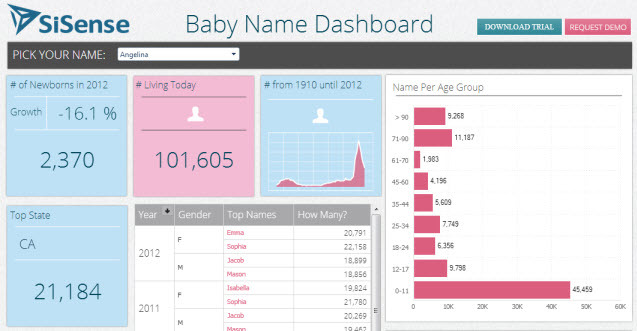 A few clicks and drags and voila…we created the Sisense Baby Name Dashboard with the all the baby names given in the United States since 1910 cut by age, state and gender. And what did we find? Female is NOT an urban legend! There are 976 Females in the US with 758 of them located in New York. Oranjello and Lemonjello, I can happily say are not names. And Badass? Also a big no. But how many people followed the Gwyneth Paltrow trend and named their daughter Apple? There are 61 other Apples out there, all born after sweet Apple Paltrow was born in 2004 with 35 of them living in… guess where? California of course. Check out what our dashbaord has to say about your own name. How popular is your name? What is the average age of people with your name? Watch out, it’s addictive.